So people are saying that Luke’s character is different, and yeah it is. But keep in mind that people change over time, especially over the course of thirty years. Like I’m not the same person I was a year ago. A lot of people also don't know that George Lucas' ideas for this trilogy (which were by-and-large scrapped by Lucasfilm) actually had Luke in a similar spot as this movie. 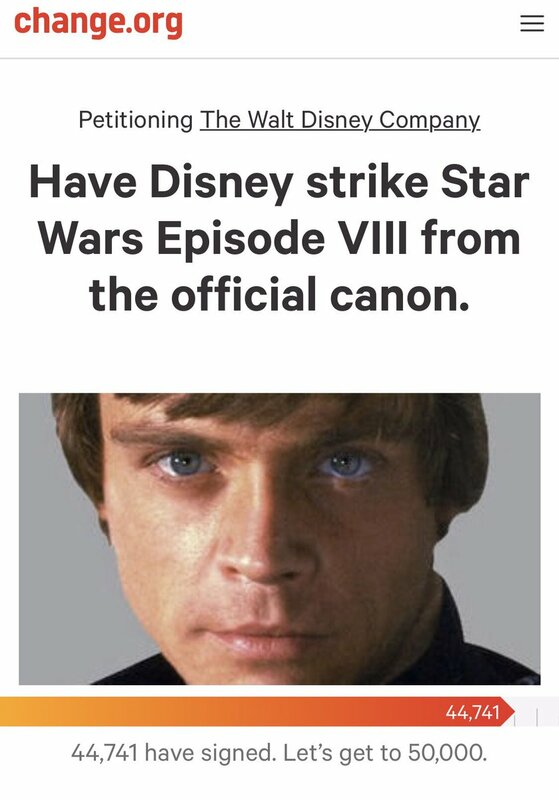 So those who object to Disney "destroying" Luke's character probably would've been disappointed either way. you know, i have actually started to wonder if Disney (or atleast the people writing the new Star Wars movies) have been trying to secretly reboot the Star Wars franchise away from George Lucas's vision. I don't know about that. Like I mentioned, even though they largely discarded his ideas, the one concerning Luke's character seemed to make the cut. This happens a lot when you have a team supervising story direction, instead of one person. There's a lot more combining and compromise when it comes to ideas. Or you can add them because you shouldn't make assumptions like that. What if someone just wanted to see what people thought? They don't want spoilers. I defend so many things. I get really passionate, but I wouldn’t say toxic. I wouldn’t threaten anyone for disliking a movie. it's because of people like those that makes it impossible for actual criticisms of the movie to be taken seriously. I just want to say I liked the movie. But I completely get where people are coming from when they say they didn’t. It's sad that some people think that these petitions need to be responded to. SMH that's only the government that's required to respond to citizens' petitions. Rey's journey had to transform into the perspective of the audience after TFA because she goes with us to demand Luke, this father figure and symbol of Star Wars, to return. I think if Rey's journey was against being special she is forced to move on. In TLJ it's explained--as a reflection of her lightsaber forceback in TFA--that the darkness it had shown her was a reflection of her denial of the truth that she was abandoned. Besides, in terms of going to Luke it's not like her story can be 'hey Luke let's go fly-fishing I don't want to fight the First Order'. _In hindsight_ I could see story taking a diffrent direction where Luke was somehow forced to abandon the fight (That would be rather expected though) but instead cannot confront Kylo because Rey is destined to do it for some reason, but it would be less interesting. Of course, what's interesting is as Rey becomes attached to Luke in TLJ Kylo Ren chooses to abandon the Vader bloodline, but this is driven by his actions in TFA. The whole film his motivated by getting closer to the Skywalker bloodline and destroying Han Solo and symbols of the rebellion. Then when Kylo becomes weaker after﻿ killing Han he is disconnected from the light, shown that the force is bigger than the Skywalkers as the saber goes to Rey, but instead it's revealed in TLJ that he sees it as the Skywalker line failing him. So﻿ he throws it all away with the Kylo Ren mask. So Grey implies opposites, mixing but they are not opposites because they are both﻿ part of the force. ​The light is 'good' not because it called the light﻿ side (Snokes death emphasizes the ambigiuty of words) but because it is the positive energy of life between things. So both sides of the Force are equals, but it's hard to describe because the film handles it in a tactful way. ​But I think it just creates a new artificial construct of grey rather than destroy our idea of both sides, it merges them. This film instead suggests the the more personal and more organic nature of the force. Of course Rey's cave scene is just a parody of fans doing an infinite internet search to find a valid theory for her parents, only to discover that what's important is who she is. Haha. I think the execution is there, but it's left ambiguous because its about the difference between Meaning, truth, and symbolism,﻿ and the past too. ​And I've only seen it once so I can't﻿ unpack it all from what I remember. For example, I think an important parallel is Kylo and﻿ Luke both hesitating only for what they want to be destroyed destroyed by a 'higher power.' ​I think it's not show how even though they think they're attached to the force they still become confined by there own constructs of what these things mean, instead of thinking about﻿ the larger world. Which is why Yoda both dismisses the books and speaks to Rey understanding all she needs, but also it being a moment of﻿ shade because she does have the books. There content is important but the context of what they mean changes﻿​ because there meaning is larger than the temple and the Jedi, but﻿ so too are the Jedi and Rey larger than the books. That's what the film means by 'we are what we grow beyond. 'Learning only comes from change, and you can't change without seeing what you have, even if what you have is not absolute or truth﻿.​So Luke learns and grows, but still holds onto his image of the legend not for himself, but for the larger world. In this case he tricks Kylo Ren to save the Resistance. ​In this sense Luke becomes and lets go of what he is. ​And then this connects back to the question of what the dark side is, which the film doesn't say, but it shows it is driven by this ignorance. That the force is active and constantly changes and grows, and the dark side doesn't. But I think this is more of a guess, because the point is the complexity of Ren attempting to grow (abandoning it all) but still wanting the power that Snoke and the Skywalker line gave him. So maybe its more like the dark side is constantly pulling us to forget the larger world, and the light side is what connects us. The Jedi forgot this thinking the dark side is external and failed. The dark side always exists in perfect opposition to what the light tells us, trying to make us hold on when the world is far more complex. That is what balance means,﻿ to understand we live with failure.That ignorance and failure can't be destroyed and is part of our nature rather than part of an opposition to one position or another. That's why this can't be described with a gradient metaphor. Because it's not about 2 believe systems, but the nature of﻿ change itself. The film is basically super zen because it constantly cuts off what we expect and forces us to accept what's outside our control, rather than outright validating it. It's about pulling us out of the moment and into the bigger picture. This and the marvel and dc divide is genuinely the worst. I can’t believe people get so worked up over this stuff to the point of sending death threats to a director who did nothing but make a movie they personally didn’t like. Critiquing the film is fine, people like Rian Johnson and Jordan Vogt Roberts are great taking genuine points to heart and working to fix them on their next project. People should realize that being civil, calm and bringing up real constructive criticism will always go further than moaning about it like a child. On another note, I loved Luke and Kylo's final battle, and I feel dumb for not realizing it was an illusion sooner. (I only figured it out after Kylo sliced through him, despite clues such as the lightsaber and the ground.) I love how Luke was able to take on the entire landing party without needing to do any crazy flips or such. In general, I feel like this movie really got the Force, both in this sense and others. We got to see some people who have had years honing their experience, and it was awesome. Snoke doesn't need to fight with a lightsaber when he can read your thoughts and move everything around him with a thought. Speaking of Snoke, I liked how he was handled. All of the crazy theories about him being Plageuis, or Windu, or a surviving Palpatine... he didn't need to be any of that, and I'm glad to see that the people behind this movie understand that. Same with Rey. They don't need to be connected to the story in their past; they're relevant because of what they're doing now. So yes, I hope Kylo is telling the truth when he says that Rey's parents are junk-planet nobodies who sold her for drinking money. We don't need some contrived reveal of their past; we just need them to do cool stuff. Well, Rey to do cool stuff. Snoke can continue being dead, he served his purpose. Which reminds me, I feel like hubris was a big theme of this movie. Luke kept talking about how it was the Jedi's pride that allowed them to fall, and Snoke was so confident in his victory he failed to pay attention to which lightsaber Kylo was turning and who exactly it was going to slice in half. Anyways, quick weigh-in on some other topics.... I liked the stuff on Canto Bight, though I have no real sense for whether it fit into this movie in particular. Holdo not telling Poe about the plan was kinda dumb, especially considering he mutinied and wasted all of their time. Someone mentioned that he would've mutinied anyways, but he seemed alright with the plan once he realized they were running to somewhere instead of just trying to get away from the First Order fleet. I was very surprised that his plan actually ended up going nowhere, though; what with Leia stunning him (which was great, by the way) and Finn and Rose getting captured. Speaking of the capture, Phasma: cool fight, but still underutilized. I really hope she isn't dead, though falling into a flaming pit tends to do it. Then again her armor seems pretty tough and the cruiser as a whole seemed to have survived, so I have no idea. As a whole, not a perfect movie, but I really loved watching it. Finally saw the movie at the behest of my sister. I didn't want to see it initially, given that I didn't like TFA all that much, but I was pleasantly surprised to have really liked TLJ! Even with the stupid stuff like the beginning conversation between Poe and Hux, the Leia Poppins, and everything with Finn and Rose, I really liked the movie. It just disappoints me that J. J. is coming back for IX, as I wasn't fond of his direction in TFA as far as casting, story, and style (especially style I mean look at all that color R. J. put into this movie! It's glorious!) are concerned. Saw the movie the other day: Overall I liked it, but there are certainly flaws with the movie. Theory: the fact that people are so divided is actually a grand scheme from Rian Johnson. The movie talks a lot about balance in the force... so what did Rian Johnson do? He made (approx.) half the film good, half bad. Balance. Now, (approx.) half the fans love it, half hate it. Balance. People really seem to forget how Rey knew how to fight before she picked up a lightsaber. According to the books, she trained with her staff. I guess. Still, a staff is different from a laser sword. I think the staff was just a crutch to skip lightsaber training.